Olimex A20-SOM is an A20 based development board from our friends at Olimex. The board helpfully reads "A20-SOM". For building u-boot, use the Olimex_A20-SOM target. 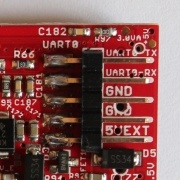 A nicely labeled UART connector is available, all you have to do is attach some leads according to our UART howto. This type of device does not get rebadged. This page was last modified on 11 April 2019, at 16:52.